ZAMBOANGA CITY (Mindanao Examiner / Nov. 1, 2011) – The Philippine military may have eliminated a Muslim rebel leader who claimed responsibility for the bomb attack two years ago on a US military convoy in Sulu province that killed 2 US soldiers and a Filipino marine. Madarang Sali, deputy supreme commander of the shadowy group called the Bangsamoro National Liberation Army, was among those reported killed in last week’s military air strikes on a mountain hideout of the local terrorist group Abu Sayyaf in Indanan town where two wanted Jemaah Islamiya militants were hiding. Sali had claimed responsibility for the deadly roadside bombing in Indanan town on September 29, 2009 that killed Sergeant 1st Class Christopher D. Shaw of Markham, Illinois, 37; and Staff Sergeant Jack M. Martin III of Bethany, Oklahoma, 26. The Fort Lewis soldiers belonged to the 3rd Battalion, 1st Special Forces Group. In previous statements to journalists, Sali, also the self-proclaimed spokesman for the Bangsamoro Federated States of Sulu Archipelago, said the Bangsamoro revolutionary forces have declared a jihad (holy war) against the Armed Forces of the Philippines and the Philippine government for the Bangsamoro homeland. He also accused US troops training Filipino soldiers in Sulu of aiding local military forces in counterinsurgency operations. Marine Major General Benjamin Dolorfino, then chief of the Western Mindanao Command, blamed the Abu Sayyaf for the attack on the US forces. But Sali said it was purely the operations of the BNLA and the Moro National Liberation Front, not the Abu Sayyaf. He said the BNLA is headed by Lieutenant General Abdulnasser Iskandar, while the MNLF are under the command of Ustadz Habier Malik, Khaid Ajibun and Tahil Usman. US troops are deployed in Sulu since 2006 and assisting the Philippine military in defeating the Abu Sayyaf. Although security officials deny US forces were directly involved in combat operations, there were numerous reports from civilians and various civil groups that American soldiers actually participated in the operations aimed at capturing or killing militant leaders in Sulu and other parts of Mindanao. Security officials said the targets of the operation were Abu Sayyaf leader Umbra Jumdail alias Doc Abu, and several Jemaah Islamiya terrorists, among them were Malaysian Zulkifli bin Hir, also known as Marwan, and Mauiya, an Indian citizen; who are all wanted by the US government on terrorism charges. There was no report if any of the three men were killed or wounded in the fighting. The trio was also tagged as behind the 2009 kidnappings of three international aid workers Swiss national Andreas Notter, Italian Eugenio Vagni and Filipino Mary Jean Lacaba in Sulu. The Philippine military confirmed that among those killed in the October 31 air strikes in Indanan’s Karawan Mountain were two Abu Sayyaf sub-leaders Ben Wagas, Apo Mike, and Abu Abad. But latest military intelligence report said that Sali Madarang and another rebel Andag – were also killed in the raid. “We have identified the bodies of those killed and three of them were notorious Abu Sayyaf sub-leaders. Two other (militants) were reported killed Madarang Sali and Andag,” Army Lt. Col. Randolph Cabangbang, a spokesman for the Western Mindanao Command, told the Mindanao Examiner. Cabangbang said they cannot confirm Sali’s claims about the attack on the US soldiers, but the military largely blamed the bombing to Malik’s group. 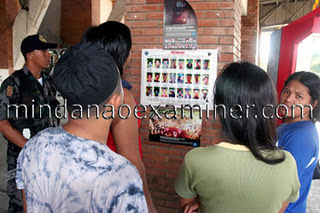 “Malik is wanted by the US government and he is being blamed for the killings of the two US soldiers,” Cabangbang said.